Diddy Kong using Rocketbarrel Boost in Super Smash Bros. for Wii U. The Rocketbarrel Boost (バレルジェット, Barrel Jet) (labeled Rocketbarrel Blast in the Super Smash Bros. Brawl instruction booklet) is Diddy Kong's up special move. Diddy Kong activates a Rocketbarrel Pack and starts charging it, slowing his fall. When the special attack button is released, he propels himself in the chosen direction. The distance the Rocketbarrel Boost will cover depends on how much the attack is charged. During the charging period, the angle that Diddy travels can be altered by tilting the Control Stick left or right; charging the move longer allows a more significant angle shift. Touching an opponent while ascending will cause minor damage. 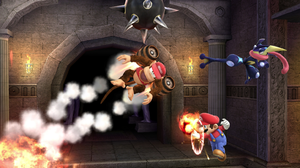 The initial burst when used in the air may serve as a meteor smash, spiking the foe while Diddy recovers to safe ground. If Diddy is attacked while using the move, the barrels will fly off and become irregularly-moving, unblockable but reflectable projectiles, exploding on contact with the stage. The player can alter the direction the barrels will move in for a small amount of time before they lose control. If Diddy hits a ceiling while using the move, he takes about 5% damage. In Super Smash Bros. 4, the move can be used to travel at more horizontal trajectories, improving the move's uses for recovery. If Diddy Kong uses Rocketbarrel Boost while swimming, Diddy will sink down a bit and then float back up. Before he floats back up a small splash animation will be seen at the top of the water. Barrel jumping is an advanced technique in Brawl and SSB4. It is very similar to Lucas's zap jump except that the zap jump can be used as an extended jump but the timings are almost exact. The player must first be knocked off the stage. Then, the player executes Rocketbarrel Boost at the same time as a midair jump. Instead of slightly moving downward with Rocketbarrel Boost while charging, the player glides upwards, and then performs Rocketbarrel Boost. This can aid Diddy Kong's recovery tremendously. "Rocket through the air and tackle opponents. Can be charged for extra distance." "Hits harder than Rocketbarrel Boost, but doesn't fly quite as well." "Charges faster and steers better, but you'll explode if you hit terrain." Rocketbarrel Attack: Deals more knockback, but doesn't fly as well. Rocketbarrel Kaboom: Faster charge and better steering, but the pack explodes if Diddy hits terrain. It doesn't go as far as Rocketbarrel Boost. The Rocketbarrel Pack trophy is unlocked by clearing Level 4 of Target Smash. An item that looks like regular barrels but becomes a rocket-powered jet pack when Diddy Kong straps them on his back. It's a convenient gadget to have when adventuring, but for whatever reason, Diddy also uses it when playing tennis and basketball. The moves he can pull off with the rocketbarrel pack are so cool that they're almost not fair. Almost. The Rocketbarrel Pack trophy is available in both versions. In Super Smash Bros. for Wii U it is part of the Animal Friends and Items Trophy Box. Two barrels modified into jet engines— throw them on and you're airborne! You can charge them up for a bigger, more accurate boost, but be careful while using these. If you get hit while you're powering up on the ground or zipping around the sky, you'll lose all control of this jet pack! Two barrels equipped with jet engines. Strap them onto your back and the sky's the limit! Use this contraption to boost your jump and control where you land with pinpoint precision. Just try not to let yourself get attacked when you're charging the jets or in the air, or things'll go haywire! The Barrel Jet in Donkey Kong 64. Rocketbarrel Boost is one of Diddy Kong's moves from Donkey Kong 64, which he can purchase from Cranky's Lab from the second level (Angry Aztec) onwards. Diddy Kong uses it to fly in the air for a short time and can also use it with his Peanut Popguns to shoot at foes in the air. The move also appears in Donkey Kong Country Returns, where it allows Diddy (and Donkey Kong, if the two are paired up) to temporarily hover. 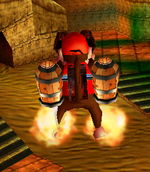 The Barrel Jet itself has a different appearance in Donkey Kong Country Returns and the subsequent Donkey Kong Country: Tropical Freeze: a tan cloth backpack containing a single rocket-shaped barrel on a metal arm. Despite this redesign, SSB4 retains the move's appearance from Donkey Kong 64. Using Rocketbarrel Boost on Little Mac and Villager. Using the Rocketbarrel Boost at an angle. Rocketbarrel Boost as shown by a Skill Preview in Ultimate. When playing as Diddy Kong on "low gravity" mode, charging his Rocketbarrel Boost in the air causes him to float up, as if the gravity was reversed. If the player is attacked in mid air as Diddy Kong, and jump after the attack, and then use the move again, the same thing occurs. Professional Smash 4 player MVD has earned the title "The Barrel Technician", due to his creative use of Rocketbarrel Boost in tournaments, most notably CEO 2015. This page was last edited on April 7, 2019, at 23:03.